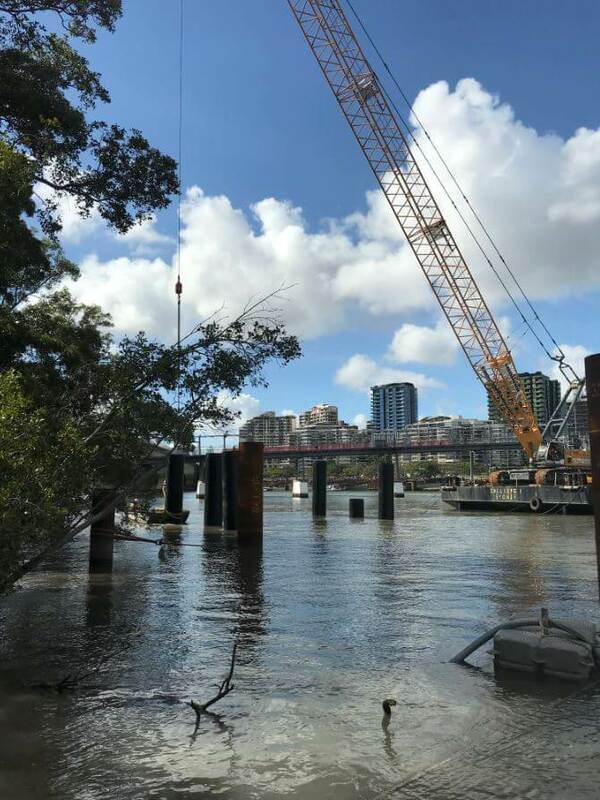 Signs of work in the riverfront area of the future Queen’s Wharf Brisbane are becoming more visible, with the arrival of pre-cast concrete panels that will be used to build the Mangrove Walk. The Foreshore South project includes the first stage of public realm for the precinct, including building a 3-metre bikeway and a separated 2-metre pedestrian path that will run continuously from the Goodwill Bridge to behind 1 William Street. These will be complemented by the above-water Mangrove Walk along the river’s edge, and Waterline Park located under the Riverside Expressway behind 1 William Street. Multiplex Project Manager Tyson Macdonald says 80% of the piling for Mangrove Walk is now complete. “The first of the concrete deck panels have arrived on-site and are being placed onto the piles,” Mr Mcdonald said. To make way for these works, the old QUT ferry terminal has now been removed. This terminal, which was damaged in the 2011 floods, became redundant when the new flood-resistant QUT Gardens Point ferry terminal opened in 2015. In November river activity will increase as concrete sections are installed. “The use of river transport is integral to our supply strategy to reduce road congestion within the CBD,” Mr Macdonald said. Onshore works are well underway for the new Waterline Park, with earthworks to remove 850m³ of material to build basins that can capture and filter upstream stormwater run-off prior to discharging into the Brisbane River. Other activities onshore include detailed excavation for foundations and retaining walls to establish terraces and usable public space for the future parkland. Widening of the Bicentennial Bikeway is also underway with the first of the micro-piles installed. Micro-piles are drilled into the ground forming the foundation for a suspended bikeway at localised pinch points, increasing visibility and providing an overall safer commute. “We continue to thank all residents and commuters for their patience and compliance with reduced speeds in the area. Our focus continues to be the safe delivery of this project for the people of Brisbane,” Mr Mcdonald said.